Elizabeth Dole has rebounded strongly after Kay Hagan's post-primary bounce in the polls. One of the biggest red flags for Hagan is difficulty in securing the black vote. Right now she leads Dole just 52-28 with them, and the 20% of African American voters who report being undecided is higher than almost any other demographic. Hagan will have to significantly improve her standing there to have any chance this fall. Hagan is also trailing 45-32 with independents even as Obama leads them 43-31. That's an indication some mass of folks are voting an Obama/Dole ticket, and she'll need to convince them otherwise. There's plenty of time between now and November but the surplus of funds that allowed Dole to wage a June ad campaign has definitely set Hagan back compared to where she was six weeks ago. John McCain continues to hold the 2-5 point lead that pretty much all public polling in North Carolina has shown over the last month. This is one state where the polls are not seeing wild fluctuations. Obama continues to have difficulty nailing down the votes of self identified Democrats here- right now he leads 67-20 among them. It's not a new phenomenon for a meaningful number of voters in North Carolina to vote Democratic on much of their ballot but not for President, but Obama will need to push that number up closer to 80% to have much of a chance of taking the state. John McCain is having a lot less trouble in this department, pulling the support of 83% of Republicans. While this may not necessarily be the year North Carolina goes blue for the first time since 1976, there is some information in the poll that could bode well for Democratic prospects in the future. Barack Obama leads 46-40 among those surveyed who were born in a place other than North Carolina. John McCain has the 49-36 advantage with natives of the state. As more and more people come to North Carolina from other places, it could trend more Democratic in national elections. North Carolina and Florida polls. North Carolina we'll poll all the statewide races, look at the differences in performance between Les Merritt and Leslie Merritt (half of those polled this time are getting it one way, half the other), and most importantly we'll find out from the people of NC who they think Sheriff Andy Taylor would vote for Governor. In Florida we'll take a look at Mel Martinez's approval rating and some possible foes for 2010 in addition to getting a snapshot of the Presidential race. We'll be the first to grant that the polls we've put out in Michigan, Ohio, and Virginia over the last week and a half have all been pretty good news for Barack Obama. The answer is that they actually don't. I think we got that reputation because of our bad poll in Pennsylvania, where we did show Obama doing better much better than he did. But we actually underestimated Obama in eight out of eleven primary polls we did, and in two of the three cases where we did overestimate his final standing it was only by one point. 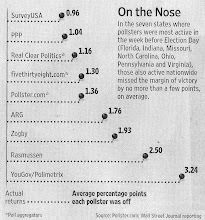 Now our polls did almost always show Obama doing better than most of the other public polls out at the same time. But that's because in most of the states we polled all of the pollsters underestimated Obama. We just didn't underestimate him as bad as most of our competitors. PPP is probably the most accessible polling company in the country. Both my cell phone number and e-mail address as well as that of Dean Debnam, who owns PPP, are easily available. Because of that we get lots of kooky (and some thoughtful) e-mails and phone calls every time we release a poll. Your wording in the first few paragraphs tells it all, “This is the 2nd week in a row PPP has found Democrats in a large Midwestern state….” Then there are the obvious signs that all you are doing is trying to influence Real Clear Politics averages, I don’t know why they use you as a resource? 3. Clincher, breakdown by party affiliation, 38% Dems, 31% GOP, 30% Other. HMMMM, I guess another good indication Conservatives don’t answer phones. Look forward to more ill conceived, pseudo surveys. By the way is Howard Dean on your payroll? PPP has conducted three surveys in the 10th Congressional District since last summer and over the course of them has seen a direct relationship between President Bush's approval rating and the percentage of voters in the district identifying themselves as Democrats- as Bush's popularity falls, Democratic party ID rises. Last August 47% of voters in the district approved of Bush's job performance and 34% identified themselves as Democrats. Now his approval is down to 34% and the percentage of folks taking the Democratic label has increased to 40%. Just since December there has been a 7% decline in Republican ID with a resultant four point increase in independents and three point increase in Democrats. It should be noted that just because more voters are identifying themselves as Democrats doesn't necessarily mean they're planning to vote for the entire Democratic ticket. Just 59% of Democratic voters in our last poll said they would vote for Barack Obama and Bev Perdue, a percentage well below normal levels. It is a strong indication, however, of how damaged the Republican brand has become. If voters in the western Piedmont of North Carolina don't want to call themselves Republicans there aren't a whole lot of places where they will. Daniel Johnson is keeping the 10th District Congressional race a lot closer than a Democrat has any business doing in this historically heavily Republican district. McHenry won his previous two elections by 24 and 28 points in 2006 and 2004 respectively. It is also a good sign for Johnson that McHenry's approval rating is at just 45%, a significant decline from a PPP poll last August that showed it at 53%. Johnson is running well ahead of Barack Obama and Bev Perdue's performances in the district, an indication that voters see him as a different kind of Democrat. Given that he is still not all that well known, those numbers are likely to improve as more voters learn more about him. While McHenry's overall standing is relatively solid, this is definitely a race to keep an eye on in the coming months. PPP took an in depth look at what voters in the 10th Congressional District of North Carolina are thinking right now. The news is mixed. Barack Obama's 21 point deficit against John McCain might not seem like a good thing- until you consider that in 2004 John Kerry lost the district 67-33 and in 2000 Al Gore lost it 65-34. The 10th District is pretty white and pretty old. If Obama can really hold McCain under 60% of the vote here, that bodes extremely well for his chances of winning the state as a whole. The news is not very good for Bev Perdue though. Her current 25 point deficit to Pat McCrory runs well behind the 56-42 margin Mike Easley was able to hold Richard Vinroot to in the district the last time this was an open seat race. Most of the 10th District is in the Charlotte media market where McCrory's omnipresence certainly helps him, but this still isn't a particularly good sign for her campaign. She only leads 59-29 even among Democrats. The Perdue campaign will have to play some serious offense, sooner than later, to shore up its support with folks in their own party in the greater Charlotte area. The 2010 Michigan race for Governor is a long ways off, and it's hard to know who of the many candidates mentioned will actually end up running. Nonetheless Dennis Archer appears to be the early favorite among the high profile quartet of John Cherry, Mike Cox, Candice Miller, and himself. It's a somewhat surprising result given that Archer has not served in public office for six years. It's also been a long time since he held statewide office, where Cox and Cherry have for the last six years and Miller did for eight years before that. It could be that the turmoil surrounding Kwame Kilpatrick is making Michigan voters look back favorably on the relatively tranquil and forward moving tenure Archer had as mayor of Detroit. PPP will test other potential 2010 candidates in its Presidential polling of Michigan in the coming months. Hillary Clinton might not be helpful to Barack Obama in Michigan if he chose her as his running mate. Of the four states PPP has polled on this issue in, Michigan is the first where it looks like Clinton on the ticket would actually have a net negative impact on Obama's prospects. 29% of independents say Clinton would make them less likely to vote for Obama, with just 18% saying her presence would make them more likely to cast a vote for her. Barack Obama begins the general election in Michigan with a nine point lead. There are strong indications within the poll that party unity is close to full strength in the state. This is the first state where PPP has found Obama doing a better job of holding Democratic voters within the party (78-12) than McCain has of nailing down the Republican vote (74-19). Obama also has a 40-36 lead with independent voters, which Michigan has a lot of. Obama's going to win any state where he's leading the white vote, and he has a 44-42 lead with it at this point. His 76-18 lead with black voters is likely to end up being larger on election day- pre-election polls frequently under estimate the percentage of the African American vote that Democratic candidates end up garnering. The gender gap in Michigan is not particularly large. Obama leads by 11 points with women and 7 points with men. Michigan had been thought to be a state where McCain could play offense, but this initial poll shows he has a lot of ground to make up. Levin is likely to win another dominant reelection. Even among Republicans Hoogendyk is polling at just 63%, with Levin pulling 23%. Levin also has a 53-27 advantage with independent voters. The debates over the weekend in Atlantic Beach seem to be generating a lot of discussion, but beyond the Capital Press Corps and already committed political junkies do you think anyone even watched? I don't think any debates except for October Presidential ones make much of an impact in politics unless someone royally screws up. It doesn't sound like Bev Perdue or Pat McCrory was very sharp on Saturday. That's fine. As long as they're sharp in the thirty second ads voters will see hundreds of times this fall they'll be alright. Case in point- Jim Neal by most accounts owned Kay Hagan when they debated in April. But that didn't keep Hagan from winning the primary by 42 points. I certainly think American politics would be in better shape if more voters watched the candidates engage with each other and made that a bigger part of how they make their voting choices. But we're pretty much at the point where all these debates do is give pundits something to chatter about while the masses turn the newspaper page or flip the channel. So far I've been eligible to vote 16 times in my life and every single one of them there has been something on the ballot that made me enthusiastic about taking the time to cast my ballot. But going to vote in Tuesday's runoff for Labor Commissioner between John Brooks and Mary Fant Donnan feels more like a chore than a privilege. Part of it is a convenience issue. There was no early voting in southern Orange County for this election, so I have no choice but to vote at the polling place. I usually leave for Raleigh around 7:30 AM and get back around 7 PM so that means I can either vote between 6:30 and 7:30 AM or in the last half hour the polls are open. Not the best options. But the bigger issue is that it is just silly to hold a statewide election solely for an office that voters don't care about, whether they should care about it or not. Whether Donnan or Brooks wins, there is no way either of them will approach the 290,000+ votes they each got in the primary. The last time we had one of these pointless runoffs June Atkinson won with less than 50,000 votes. I can see why you want to avoid some fringe candidate winning with 20% of the vote in a 10 candidate race or something. In theory I like the idea of a candidate having to show at least 40% support to get the party's nomination. But given what statewide offices we're ending up having these runoffs for, I think the legislature needs to look at a bill in the next session to restrict runoffs to Governor and Senate, contests that a significant mass of voters might actually follow and feel like they have a stake in. The best indication to me of the low interest in this race is that only one person in the last seven weeks has asked me if we were going to poll it. For contests that people are interested in we get that question all the time. No, we haven't polled it, but I will predict that Donnan wins with around 60% of the vote. I am not committing to any particular days for these releases since last week I over promised and under delivered, but we are going to have a new poll for my native state of Michigan, a look at Richard Burr's approval rating two years out from his reelection year, and a snapshot of how things are going in the 10th Congressional District where Patrick McHenry is facing off against Daniel Johnson. I don't have much to say about this week's Civitas polls, not because of any problem with them but because the races right now are largely stagnant. Sorry the blog has been so boring lately, at least on the NC politics front. For President they have John McCain up 45-41 on Barack Obama. No surprise there. The poll has gotten criticized in some quarters for only being 18% black when the 2004 exit poll for North Carolina said the electorate was 26% black. The exit poll was not correct- the data from the state Board of Elections indicates that black voters actually made up just 18.5% of the electorate that year. I do think Obama should push black turnout to 20 to 22% in the state, but Civitas' percentage is not completely unreasonable. For Senate it's Elizabeth Dole at 48% and Kay Hagan at 38%. That seems a little more realistic to me than the Rasmussen poll showing it at a 14% deficit for Hagan last week. That would basically equate to Hagan having completely lost the bounce she got from running an active campaign in the primary, and while it does seem that a good amount of that has dissipated I don't think it's gone completely kaput. Hagan is only polling at 61% with Democrats in the poll- that doesn't necessarily mean the poll is wrong at this point in the game but I'm sure Hagan will be doing much better than that by the end. For Governor Bev Perdue is at 43% and Pat McCrory has 41%. This general election has been exceptionally boring so far. The most recent poll regarding religion and foreign policy shows that 61% of North Carolinians responded as born again Evangelical Christians. 59% of Evangelicals believe the Bible is the literal word of God and 96% believe in the 2nd coming of Christ. In this group, respondents were more likely to approve of Bush's handling of the War on Terror, were more likely to support the State of Israel and were more likely to view a clash of civilizations between the West and the Middle East. With respect to the Israeli-Palestinian conflict, 40% of Evangelicals felt the Palestinians have not been treated unfairly, 61% sympathize with Israel, and 59% believe the U.S. should support Israel at all costs. 40% believe that the War on Terror is part of a larger war between Christians and Muslims. According to this poll, the "Clash of Civilizations" perception appears to be most evident among the Republican and Evangelical respondents. Overall, both Evangelicals and non-Evangelicals perceive a cultural rift between the West and the Islamic World. It is worth noting, that the poll's Evangelical numbers are high, thus some of the results could be skewed in favor of Evangelical attitudes; however, among non-Evangelicals, there is more division over the Israeli-Palestinian conflict, religion shaping foreign policy, GWOT, and the U.N. In the latest survey conducted by Public Policy Polling, 507 likely voters were polled on their general thoughts about the various impacts that a running mate has on a presidential election, and also the overall impact a vice-president has on the policies of the president. 46% of the respondents said that the presidential candidate's choice of a running mate has a strong impact on their vote. I'm skeptical about the validity of these responses because that would seemingly imply that almost half of the voting population in North Carolina would potentially change their vote solely based on the candidate's running mate. It also doesn't fully match up with the other survey responses, because when asked about Clinton's affect on an Obama vote, 32% said they would vote for Obama no matter what and 33% said they would vote for McCain no matter what. This shows that only 31% are actually more or less likely to vote for Obama based on his choice of running mate. Larry Kissell has a new internal poll out showing him leading Robin Hayes 45-43. These things should always be taken with a grain of salt but I certainly would not be surprised if the poll is an accurate picture of the race. But what I really find remarkable in the poll is that they found voters in the 8th District supporting Barack Obama 50-37! Bush beat John Kerry 54-45 in 2004 in that district, so that is quite a remarkable shift. I will guarantee that if Obama beats John McCain by double digits in the 8th District he will win North Carolina. Obama should also have coattails for Kissell if he's really running that well in the district. Imagine a Democrat at the top of the ticket in North Carolina pulling other folks along instead of dragging them down! Kissell's pollster, Anzalone Liszt Research, is one of the best and has particularly shown an adeptness this year for helping Democrats in the south win districts they have no business winning- NC-8 looks like a cakewalk compared to some of the ones they've pulled out. It seems fairly obvious here that the real question for Obama when considering how to win North Carolina is to weigh his options with both Clinton and Edwards. They both show support from voters in the sense that more of the likely Obama voters will vote for Obama with either of them on the ticket than without, however there is a wider gap between these voters with Clinton. This really just shows that people have slightly stronger feelings overall when it comes to Edwards than with Clinton, since he's a former N.C. Senator. It doesn't appear to be much of a contest with Easley, since twice as many voters say that they would be less likely to vote for Obama with him on the ticket than more likely. When broken down by race neither Clinton nor Edwards has an edge since, for example, African Americans responded almost the same with their likelihood of voting for Obama should either of these candidates be chosen as running mates. This isn't necessarily a surprise, but it's still interesting to see that neither candidate has a true lead in the race category. It seems that overall Clinton would have more support on a national level, but in North Carolina John Edwards seems to be a legitimate contender. If Edwards does pull through, though, it'll be interesting to see if he can correct his 2004 failure of not taking his home state. Republican Attorney General Bob McDonnell has a small lead over his possible opponents next year in the race for Governor, not a huge surprise given that he serves in statewide office and they do not. One key factor accounting for McDonnell's success is that Republicans are getting behind his candidacy to a greater extent than Democrats are supporting their possible nominees at this point. While McDonnell has a 69-6 lead among Republicans against Deeds and a 70-3 lead against Moran, Deeds has just a 49-14 lead with Democrats while Moran's is 50-15. Obviously it's a long way until next November! Although Mark Warner has sworn off consideration as a possible running mate for Barack Obama in Virginia, it sure looks like he could help put the ticket over the top in his home state. In addition to being popular as a Vice Presidential pick among Independents (24/16) and Democrats (19/7), his possible selection would even make more Republicans (10/6) likely to vote for Obama. By contrast Republicans report being less likely to vote for Obama if Kaine, Webb, or Clinton is the pick. On a related note, Warner leads Jim Gilmore 59-28 in his Senate bid. Democrats may be concerned about picking Warner because of the certainty that the Senate seat will go blue, but with Gilmore polling below 30% one has to think that another Democratic challenger would be a strong favorite for the seat as well if Warner was to join the ticket. Although there doesn't appear to be much enthusiasm for Tim Kaine or Jim Webb as possible running mates, it doesn't mean they're unpopular. Kaine has a solid 46/30 job approval rating, and Webb's is 44/33. Virginia voters just appear to want them to continue serving in the positions they have now. Clinton is a popular possible running mate choice among Democratic voters, but would have a negative impact among Independents (18/25) and Republicans (5/11). Barack Obama begins the general election in Virginia with a slight lead. The key to his success, as in Ohio, is that he is bringing most Democrats back into the fold following the contentious primary season. He leads McCain 78-17 with folks in his own party, a perfectly respectable showing in a southern state where many who identify themselves as Democrats don't necessarily vote that way in federal elections. Good news for Obama in the crosstabs shows him trailing McCain only 50-41 with white voters. The poll found Obama leading McCain just 67-32 with black voters at this time, but realistically his advantage has to be greater than that and will likely build toward the election. Polling this year has consistently underestimated the percentage of African American voters Obama ends up receiving. There is a significant gender gap in the numbers, with Obama leading by ten points among female voters but trailing by eight points among men. A new PPP survey finds that only 15% of North Carolinians support a bill being pushed by Clark Jenkins to allow 53 foot trucks to travel on most state roads. 58% of those polled are opposed to the measure with 27% unsure. This issue is remarkable in terms of how broad based the opposition to it is. Every single demographic subgroup- men, women, white, black, young, old, and across the political spectrum is opposed with no group expressing more than 20% support for the initiative. We've had several folks ask about the party id breakdown on our Ohio poll, which was 55% Democratic, 30% Republican, and 15% other. Obviously that would show incredible movement in a Democratic direction on party id. The 2006 exit poll in Ohio found a 40-37 Democratic edge, while the 2004 exit poll showed Republicans with a 40-35 advantage. If PPP was the only company that found such a strong Democratic party id average, we would most likely have weighted for party to bring it more in line with those numbers from 2004 and 2006. We're not the only one though. SurveyUSA, which doesn't weight for party, found a party distribution of 52% Democrats and 28% Republicans in its most recent Ohio poll. Since the party breakdown we found was pretty similar to that, we feel confident enough in it not to weight for party. The reality, I think, is that the Republican brand is even more damaged in Ohio than it is in most states around the country. If George Voinovich decides to run for another term in the Senate in 2010, he could be in for a fight. His approval rating is just 31%, and in possible match ups with Congressmen Tim Ryan and Betty Sutton he can't reach 40%. Ryan and Sutton have little statewide profile so the fact that Ryan is running even and Sutton just behind Voinovich, who has been in statewide office for almost two decades, is pretty remarkable. PPP will continue to test possible candidate against Voinovich as they emerge in the next six months. PPP tested Hillary Clinton and Ted Strickland as possible running mates for Barack Obama in Ohio, and found that even though Strickland has a very good approval rating, Clinton would be the better choice in the state. Governor Strickland has a 47/26 approval rating, but when it comes to putting him on the ticket, 15% of Ohioans say that would make them less likely to vote for Obama, while just 11% say it would make them more likely to vote for him. Strickland has sworn off consideration for placement on the ticket, and this survey is confirmation that for the most part Ohio voters would like him to complete his term as Governor. The poll also found that Obama choosing Senator Clinton as his running mate would have a net positive impact in the state. 19% said they would be more likely to vote for Obama, while 15% said her presence would make them less likely to support him. Clinton's support is particularly strong among self identified Democrats- 28% of them would be more likely to vote for Obama if she was chosen as his running mate. She could be a deterrent to the independent voters Obama hopes to attract though- 27% of them would be less likely to vote for him with Clinton on the ticket. Barack Obama begins the general election in Ohio with a double digit lead over John McCain. It's a major improvement from PPP's most recent previous Ohio poll, taken at the height of the Jeremiah Wright controversy in March, which showed Obama trailing McCain 49-41. The key difference for Obama is that he's got his party behind him to a much greater extent than he did then. He leads 73-17 with self identified Democrats in this survey, compared to just a 62-27 advantage then. That's a pretty good indication of a unity bounce with Clinton supporters who may have been reluctant to say they would support him if he was the nominee then starting to get behind him. The poll results show no gender gap- Obama leads equally with both men and women. Obama is winning independent voters 45-32, has a small 46-42 lead with white voters while showing his usual major (75-21) advantage with black voters, and leads with every age group except voters over 65. Sorry for being a tease! We'll have the Ohio results out tomorrow morning. Promise. We've had a bit of a layoff but we're getting back into the game with general election polling in Ohio and Virginia next week. Beyond the horse race in Ohio we'll look at what impact the selection of Ted Strickland as running mate would have on Barack Obama's prospects in the state. We're also going to take a look ahead to the 2010 Senate race in the state, gaging George Voinovich's popularity and testing him against some of his possible Democratic opponents. In Virginia we'll have numbers for President and Senate, a look at the impact Mark Warner, Jim Webb, and Tim Kaine could have if added to the ticket, and an early look at the state's 2009 race for Governor. The plan right now is for an Ohio release on Monday and a Virginia release on Tuesday. Stay tuned. Although the end result of the WRAL/Rasmussen poll on the race for Governor seemed perfectly reasonable, one thing within the crosstabs did not. The survey found a reverse gender gap, with Bev Perdue leading among men and Pat McCrory leading among women. That's quite a different story than our recent polling on the race has found. In our most recent survey Perdue led by 15 points among women and McCrory led by 9 with men. The time before that Perdue had a 12 point lead with women while McCrory had a 15 point edge with men. I am pretty sure this race will see the typical gender gap and not this strange inverse one that Rasmussen found in its most recent poll. Elizabeth Dole's ad campaign is taking a bit of a toll on Kay Hagan, as Dole is back up to a 53-39 lead after the previous Rasmussen poll showed Hagan with a one point lead. I'm not surprised that Dole's favorable/unfavorable has improved to 62/33 from 56/38 in the last poll given that her ads have presented her in quite a positive light. But I do find it a little surprising, given that Hagan hasn't been attacked or anything, that her numbers have declined from 53/30 to 45/32. I imagine that can mostly be chalked up to sampling error. It'll be interesting to see a) how long Dole stays on the air and b) how quickly Hagan can get back on. The Dole campaign has consistently attacked automated polling, so I expect we won't hear much gloating from them on this one. Rasmussen's gubernatorial poll shows Bev Perdue leading Pat McCrory 47-46. For some reason they included Michael Munger in their poll last month, but then didn't this month. I think Munger is worth a point or two to Perdue so her lead is likely a little better than this. Interestingly McCrory's positives are higher than Perdue's and Perdue's negatives are higher than McCrory but Perdue leads nonetheless. 1) There are probably more Democrats who have a favorable view of McCrory but are voting for Perdue anyway than there are Republicans who like Perdue. 2) McCrory's benefiting from the relatively free pass he got in the primary and is a lot more brittle than Perdue. Perdue's already stood up well to the nastiest attacks she's likely to face this year, while McCrory hasn't had to do any of that. When Mike Easley came out with his budget last month proposing increases in the cigarette and alcohol taxes to pay for some of his priorities, it didn't take long for Joe Hackney and Marc Basnight to pretty much say that wasn't going to happen. Their rationale is most likely that they don't want to do anything that Republican challengers could try to lord over Democratic incumbents this fall, but I figured if there were any tax increases that wouldn't be totally unpopular in these economic conditions they would be the ones Easley proposed. Today's WRAL/Rasmussen Reports poll confirms my thinking- 58% of respondents said they supported Easley's proposal with just 34% expressing opposition. Does that mean Hackney and Basnight were incorrect about the political fallout that would have? Not necessarily. I'm sure Republican legislative candidates would talk about the issue in much more negative terms than the balanced language Rasmussen used in the poll question. But it might not have been quite the unpopular proposal that the Democratic legislative leaders seemed to think it would be. Rasmussen's new poll for WRAL is out, and it's another indication that the race could be close in North Carolina and that Bob Barr could be making an impact. John McCain leads Barack Obama 45-43, which I think makes this the closest poll we've seen yet. The survey didn't specifically ask about Bob Barr, but 6% of respondents expressed support for 'other,' with 5% undecided. The race is within the margin of error either way but I almost wonder if Obama would have had a small lead in the poll if Barr and his party affiliation had been named directly. It seemed like the presence of Barr knocked 3-4 points off of McCain's lead between our last poll without him and our last poll with him, and I can't imagine the 6% who said other in this poll were all specifically thinking of Barr. Since the only 'other' choice in North Carolina is going to be Barr, that's why we're including him and not the blanket 'other' choice in our polling of the race. WRAL hasn't posted the full crosstabs from the survey on their website yet but if they do I may have some analysis on them later. Any time over the last year and a half it's been suggested that Elizabeth Dole might have any difficulty getting reelected, her campaign has angrily refuted the possibility. The most recent example is her camp's blanket condemnation of recent polls showing the race tightening. "My race is going to be tight, Elizabeth's race is going to be tight,” added Charlotte Mayor Pat McCrory, the Republican candidate for the state’s governor position. “I don't think anyone knows what's going to happen in November." I certainly agree with him that no one knows what's going to happen in November, but the admission that Dole might have some difficulty with Kay Hagan is a lot different than the tune that's been coming from her campaign. Then over the weekend NRSC chair John Ensign said in a campaign appearance for Georgia senator Saxby Chambliss that his reelection was vital to ensure that Republicans retained control of 41 seats in the Senate so that they can filibuster legislation they don't like. Having that as a goal, rather than talking about trying to regain their majority, is a pretty good sign of how low Republican expectations are right now. And if Ensign is really expecting to lose at least eight seats this fall, you have to think North Carolina might be on that list. It's a whole different story than last summer when Mark Stephens was blaming IVR for any signs of Dole vulnerability. Robin Hayes' internal polling says he's losing to Larry Kissell. I don't have any insider information to that effect, but there's no way he would be leading off his media campaign with a negative ad all the way back in June if that wasn't the case. Hayes ran negative ads against Kissell in October last time, and Kissell didn't have the funds to respond as effectively. Hayes just barely managed to pull out the win. Hayes clearly think he's even more vulnerable this year, and the even worse news for him is that this campaign will be fought on a completely different playing field with many more resources available to Kissell than he had the last time around. Unless things turn around nationally between now and November, Hayes will be cleaning out his office come this fall. I don't disagree, but his numbers make no sense. -George W. Bush received 1,961,166 votes in 2004. -There are 51,926 more registered Democrats and 223,829 more Unaffiliateds than there were in the state four years ago. -Combine all the newly registered Democrats and Unaffiliateds with the number of people who voted in the Democratic primary, and it is less than the number of people who voted for Bush in 2004 so Obama has no chance. Here is the remarkably fatal flaw in his logic: he is operating under the assumption that everyone who is going to vote Democratic this fall voted in the primary. Sure we had higher turnout than usual in the primary, but there are still hundreds of thousands of folks who didn't vote in May who will vote in November. He pretty much completely ignored that uncomfortable fact in his analysis. I'm certainly not guaranteeing North Carolina will be competitive this fall but if he is going to entreat us to 'believe the numbers' then he should analyze them in a way more rooted in reality. It's going to be very interesting to see state by state polling in the next few weeks now that Hillary is out of the race and has endorsed Obama. Our most recent poll, conducted a week and a half ago, found only 58% of Hillary supporters would support Barack Obama against John McCain. If a good chunk of those 42% of Hillary folks we polled last month who didn't say they supported Obama are like Paula Dorn, I expect we're going to see the poll numbers by state point to a take of more than 300 electoral votes for Obama by the end of the month. Ryan over at the Dome blog is reporting that Rep. Ric Killian, the North Carolina veterans' coordinator for John McCain, says that Iraq will be the 'paramount issue' in the fall election and will keep the state red. Recent North Carolina polling shows that the Republicans better hope Iraq is not the biggest issue in voters' minds this fall. Our mid-May survey showed Obama leading McCain 47-46 among voters who said their biggest issue was the war. A Survey USA poll done around the same time showed Obama with an even greater 56-42 edge on that issue. Our poll at that time also showed Obama leading McCain on the economy, education, and health care. If McCain wants to be successful he should be hoping moral and family values, taxes, and immigration end up being big issues for NC voters this fall, because that's where he's getting his advantage. Jim Neal has been about as gracious a loser as you could ever ask for since the Senate primary. Almost immediately once the votes were in he enthusiastically got behind Kay Hagan and pledged to do anything he could to help her get elected. He's shown that he really meant it over the last month by making numerous positive statements about Hagan, and he reports over at BlueNC that he's even hosting a fund raiser for her. Richard Moore should take a lesson, sooner than later. Bev Perdue is in pretty good shape, but some of the interests that supported Moore in the primary could conceivably move toward Pat McCrory, and if Moore is a good Democrat he'll do what he can to stop that from happening. It's good news for North Carolina Democrats that Barack Obama is keeping Howard Dean on as chair of the DNC. Dean has been much reviled by some party insiders for his '50 state strategy,' but it has helped pay clear dividends as Democrats won recent Congressional election in Mississippi and Louisiana districts that they had no business competing in. The Obama campaign has the same goal of expanding the Democratic map that Dean does, and that makes it more likely that the campaign will be taken seriously in the state all the way through October. Across the board it appears DC Democrats are giving North Carolina more respect this year. Obama seems to be serious about contesting North Carolina. The DSCC is helping Kay Hagan raise the money she needs to beat Elizabeth Dole. And the DCCC is taking Larry Kissell's bid to knock off Robin Hayes very seriously. It would be great if they expanded their sights to campaigns like Daniel Johnson's to knock off Patrick McHenry, but it's nevertheless a much better situation than we had at the same time two years ago. In late May 2004, a Mason Dixon poll showed George W. Bush leading John Kerry 48-41 in North Carolina. It also showed that with Edwards on the ticket, the margin narrowed to 46-45. Of course Edwards was chosen- and that seven point deficit turned into a 12 point loss. The lesson? The Vice Presidential selection is certainly important, because it will line someone up as the leading contender to be our next President- but the running mate is very unlikely to have much of an impact on who actually wins this fall. Yesterday Kay Hagan released an internal poll showing her trailing Elizabeth Dole by only four points. In May 2002 Democrats in North Carolina were touting their internal polling as well- showing Erskine Bowles trailing Dole by only 19 points. Other polling out at the time had the margin over 30 points, so even though it showed Bowles getting defeated pretty roundly people were skeptical of his internal poll. Not only is Hagan doing way better in this month's internal poll, but it's also very much in line with what independent polling is showing. There's no doubt Dole's in a much worse situation than she was at this same time in the cycle the first time she ran. Pat McCrory has a guy with a 33% approval rating in North Carolina coming to help him raise money next month. Usually Republicans in North Carolina try to tie state level Democratic candidates to national Democrats. But given McCrory's coziness with the unpopular President Bush, Bev Perdue (or her surrogates) have to give some serious thought to turning the tables this year. When is the last time Democrats in North Carolina tried to erode an opponent's credibility by tying him to the national Republican party? Sure hasn't happened since I've been down here. This is a pretty curious move on McCrory's part. Two years ago when Bush showed up in Florida on the eve of the Gubernatorial election, Republican nominee Charlie Crist went out of his way to avoid appearing with him. Bush's popularity has been further eroded since then. It will be interesting to see whether or not this becomes an issue in the race for Governor. -Supporters of Bob Barr go for Elizabeth Dole 51-34 in the Senate race, and for Pat McCrory 45-22 in the Gubernatorial race, with Michael Munger right behind Bev Perdue at 21%. That's just more confirmation that even if the poll made it look like Barr was pulling equally from self identified Democrats and Republicans, the voters he's earning support from are Republican leaning voters even if that's not what they call themselves. -The Libertarians may be the male party. 63% of respondents who support Munger are men, compared with 53% for McCrory and 38% for Perdue. 58% of Barr's supporters are men, compared with 52% for John McCain and 39% for Barack Obama. -Quite a sign of how Hillary Clinton has antagonized African Americans- 29% of Barr's supporters are black and just 19% of hers are. Who knows what the truth is about whether Hillary Clinton will concede or not tonight, but either way it's just a matter of time. The big question of course is whether or not her supporters will get in line with Barack Obama. Looking at our poll from yesterday, those who would vote for Clinton in a match against John McCain are not necessarily going for Obama. Right now their votes break down as 58% for Obama, 19% undecided, 18% for McCain, and 5% for Bob Barr. You have to think most of those undecideds are eventually going to end up supporting Obama. If he received the support of 80% of Clinton's supporters rather than the 58% he's polling at right now, he'd be leading McCain by a margin of about 46-43 in NC. If Democrats can get on the same page in the state, Barack Obama will have a decent chance of taking North Carolina this fall.